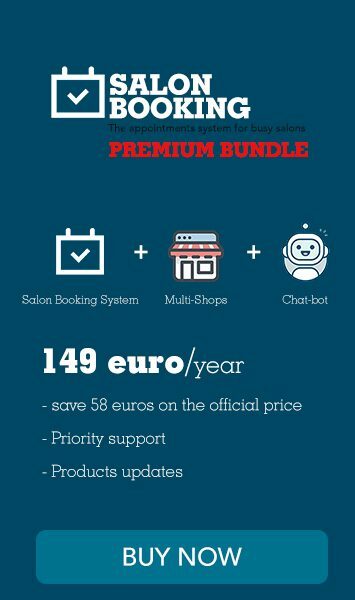 In this article we’ll provide you some crucial information on how to optimize the speed of the booking process with Salon Booking System and offer to your website users a good booking experience. Let’s start saying that one of the most important thing to consider to guarantee a good performance of the booking process is represented by your hosting. A cheap non professional hosting are more likely to cause a slow down of the booking process due a lack of enough server resources. We do suggest you to opt for performing hosting plans, even if they are a little bit more expensive they will guarantee high performances and your website users will benefit from a responsive website. We imagine that you are using Salon Booking for your real business and saving money relying on a bad hosting is never a smart choice. The next step is verify that the your WordPress website is loaded with the minimum number of plugins installed. The plugins in most cases burden your page load time and threaten the user experience of your customers once on your website. Our suggestion is to keep plugins in a limited number, use only those really needed for your website and discard those ones not necessary. Now it’s time to see at Salon Booking settings for a further optimization. The smaller is the option the harder is for the plugin to make its calculations. We thing that using a 15 minutes hour fraction is the best solution. Under this fraction the booking process will get little slower. Keep this option as short as possible. Three months are a perfect choice, six are still good but the larger you go the slower it will be. The more rules you create the slower the booking process will be. So keep them limited to the strictly necessary. Especially those ones inside the Services and Assistants section. DO NOT USE ON-LINE AVAILABLE DAYS RULE INSIDE ASSISTANTS AND SERVICES UNLESS A SPECIFIC SERVICE OR ASSISTANT IS FOLLOWING A DIFFERENT WEEKLY TIMETABLE. This is very important to guarantee a quick booking process. Many of you make the mistake of adding “Booking rules” inside each assistant or each services that are the same one used inside the salon settings. That’s it. Keep in mind these suggestions every time you see that your booking process is getting slower. If you are pretty sure that you respected all the above suggestions but the booking process is still slow then get back to us.